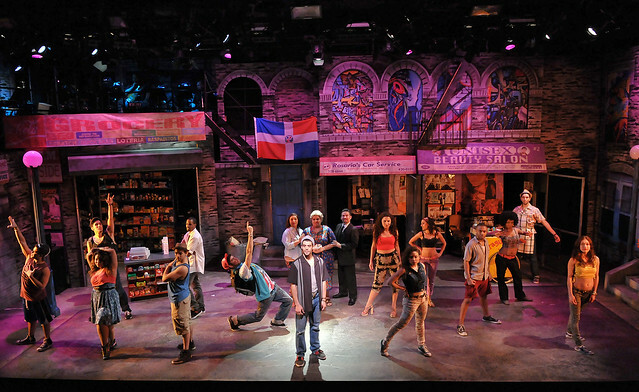 (Boston) In the Heights tackles heavy subjects such as endemic poverty, Immigration Reform, affordable education and racial stereotype with canny artistic expression. This community in Washington Heights might be needy but they are not poor. They are proud, hardworking and passionate people who strive for a better life. Just like you and me. This music incorporates traditional Latin dance with Rap, Hiphop, and Flow poetry, among many others. The dancing looks like it is straight from America’s Best Dance Crew. The ensemble dance scenes are electric and justifiably make the show the stand-out production that it is. The cast adapts to the different styles and each other with such ease it’s as if they studied at the same school. The singing is passionate even in it’s quieter* moments. The whole cast is brilliant. The solos are as dramatic as opera arias and just as moving. In particular, Diego Klock-Perez shines brightly as the hero Usnavi. His performance looks and sounds as natural as breathing. The audience in inundated with color. From Jenna McFarland Lord’s scenic designs to Elisabetta Polito’s costumes, the stage is awash in a symphony of polychromatic design. Colors of blue, reds and greens bleed from the actors onto the stage as they sing and dance. Their emotional content is no less dramatic. The costuming reflects the action on stage as much as it feeds it. In the Heights has a tightly written script that reads like a production of Hair if it were fused into West Side Story. Speakeasy’s is a good production. Go. *A shoutout to Jared Dixon’s abs. This entry was posted in Musicals and Opera and tagged affordable education, America’s Best Dance Crew, BCA Plaza Theatre, Boston, Diego Klock-Perez, Elisabetta Polito, endemic poverty, Flow poetry, Hiphop, Immigration Reform, In the Height, Jenna McFarland Lord, Larry Sousa, Latin dance, Lin-Manuel Miranda, Nicholas James Connell, Paul Daigneault, Quiara Alegria Hudes, racial stereotype, Rap, Speakeasy Stage Company, West Side Story by Kitty Drexel. Bookmark the permalink.